The humble guitar strap is a piece of gear that takes care of a simple task in a physical sense. It’s used to hold a guitar while standing, so the players hands are free to worry about other tasks, like playing the instrument. But it does a lot more than that. With the range of colours, patterns, imagery and materials used these days, the strap is a fashion accessory too. 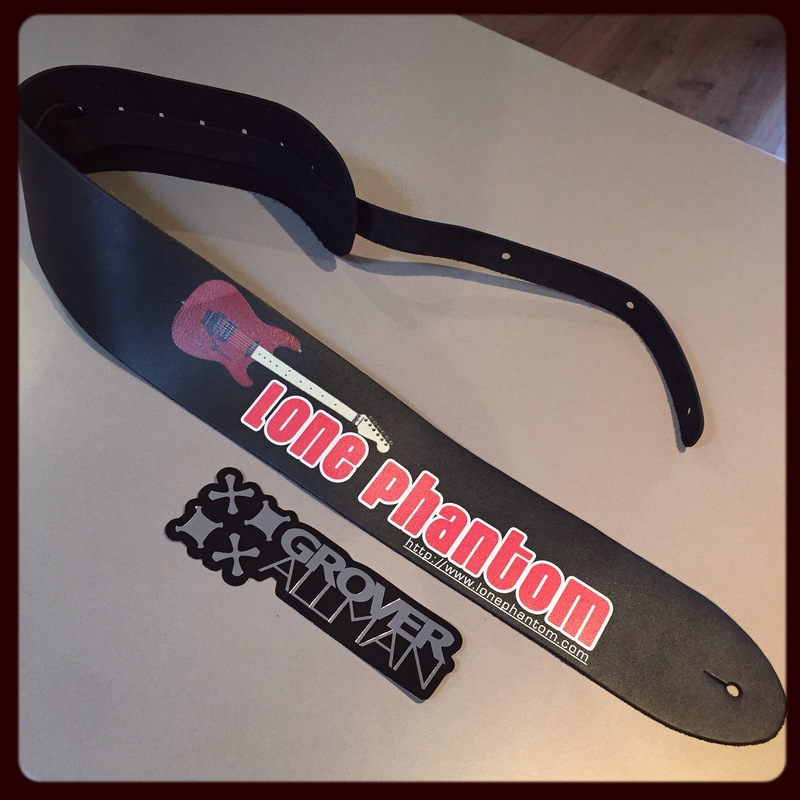 There is a step further that you can take with the guitar strap to really make it stand out from the crowd, and that is getting a custom printed leather guitar strap from Grover Allman. Grover Allman custom printed guitar straps come in black or brown leather, and strap widths of 2.5″ and 3.5″. They say that they can print any image, artwork or even photo to a guitar strap. I was curious to find out more about how it all worked and Grover Allman were kind enough to provide me with a voucher code to try out their custom straps. First off, looking at the online order process, the ordering system is nice and user friendly. Upload your artwork, specify the strap colour and width, your quantity and add to cart. There is information at the bottom of the page with regards to size and formatting of the artwork. If you have any further requests or questions you can enter them in the extra order details. Once you’ve added to the cart Once that’s all done you go through a pretty simple payment process and the strap is paid for. The good people at Grover Allman will then mock up your artwork on a strap and send you an image of it to ensure that it meets your requirements before anything is made. Here you can suggest any adjustments if needed. This ensures that you get exactly what you imagined. The design team were even nice enough to modify my image to ensure it had the best possible quality when it was printed on the strap, an excellent example of their customer service. Once I had given approval to the final design the production of my strap was scheduled in and I was advised of production and mailing time frames, and tracking information was emailed to me once the strap had been mailed out. Good customer service is at the point of sale is always important, but a company always needs to deliver once the sale has been finalised and a product is received. I received the strap a few days after I received the mailing notification, and let’s just say that the strap lived up to the expectations set by their customer service. The leather used for the strap is nice and soft and pliable, giving it a nice worn in feel. It instantly feels nice and comfy on the shoulder, like you’ve been using it for years. The print work looks fantastic and holds up well to scratching. There is plenty of adjustment range in the strap too, with it capable of going from 96cm to 142cm. Overall the Grover Allman custom printed leather guitar strap is an absolute winner. The ordering process, prices, the quality of the strap, and the overall customer service is second to none. If you are looking for something a little bit unique from your guitar strap, or looking for the perfect gift for a guitar playing friend or family member that won’t break the budget, definitely check out Grover Allman.